Nora Istrefi is back with confidence in "Magic Song 2013" and through a photo that is being commented alot these days, she's shown that everything is fine between her and Ardit, after misunderstandings back in 2010 edition. 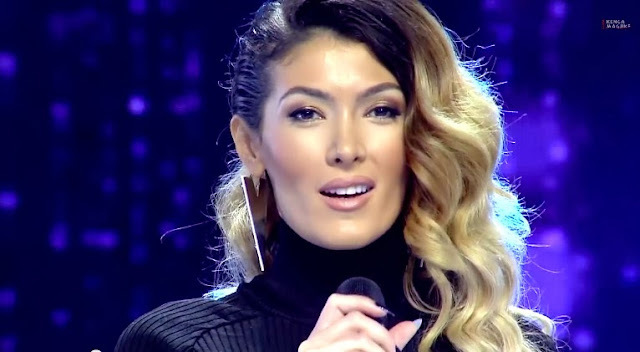 On Sunday she presented a beautiful song entitled "You are mine", written by Aida Baraku and Armend Rexhepagiqi, with lyrics by Arjanit Palaj and instrumentation by Arber Gjikolli. But even this time, she could not flee from accusations for copying the styling, as there seem to be tireless enthusiasts that will necessarily find something in this direction. It is about a model and TV presenter named Marianna Hewitt, who Nora has "copied" for clothing (see further down). However, copying or simply a fashion trend, Nora has shone on stage, whereas, her song is being liked by many fans and is commented as one of the favorites to win a good prize on the final nights, which will further smoothen the friendship with Ardit. Nora dhe Arditi! S'ka me mosmarreveshje!